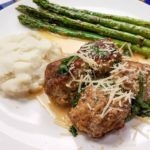 Meatballs that are easy and healthy?! Yep! These super easy Instant Pot Swedish meatballs are delicious, easy to make, and they’re versatile. You can whip them up for dinner or an appetizer, they even go great for parties. 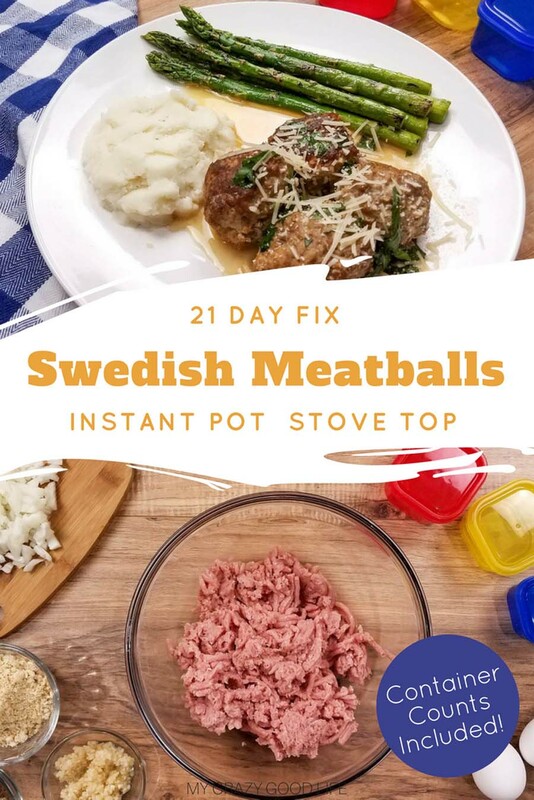 21 Day Fix Swedish meatballs make a great addition to your next weekly meal plan as well. I feel like I never get done talking about how quick and easy dinnertime is with the Instant Pot. I love having a great tool on hand that can help make everything from breakfast to dessert all while keeping it within the parameters of my 21 Day Fix lifestyle. Just like these easy Instant Pot Swedish meatballs, I know the whole family will be satisfied (and secretly eating a healthy meal). 1) In a large bowl mix together ingredients for meatballs. Turn Instant Pot to saute, and melt 2 tbsp butter in the Instant Pot. 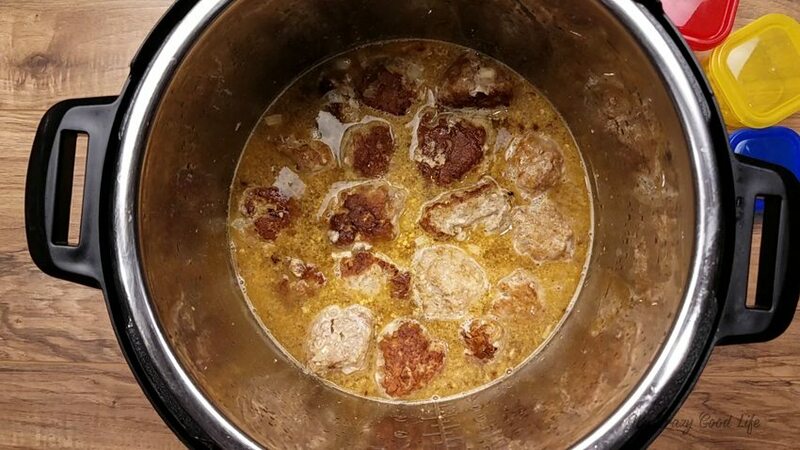 When the butter is melted form the meatballs and place in the Instant Pot to sear, turning as needed. This will help the meatball hold their form. 2) Remove meatballs and set aside. Pour the chicken broth into the Instant Pot, use a plastic, wood, or silicone utensil to scrape the bottom of the Instant Pot. Mix in the aminos and mustard, then gently add the meatballs back into the Instant Pot. Lock the lid into place cook on high pressure using the manual function for 5 minutes. Let pressure naturally release for 10 minutes before doing a quick release of the pressure. 3) Turn off the Instant Pot, remove the meatballs and let the sauce cool to about room temperature. Whisk in the plain Greek yogurt until the sauce is smooth, and add the parsley. Let sit a couple minutes to allow the parsley time to soften. Pour the sauce over the meatballs and serve topped with parmesan cheese. Note: If the sauce is still hot when the Greek yogurt is mixed it will curdle into cheese curds. So be sure to give the sauce time to cool before mixing in the yogurt. This is the perfect time to prepare side dishes. Is this a recipe for 21 Day Fix Swedish Meatballs? For all you 21 Day Fixers the container info is as follows: This recipe makes 16 meatballs of equal size, which is 4 servings of 4 meatballs. 1 Red Container, 1/4 Yellow Container, 1.5 tsp. Parmesan garnish is optional, and counted with a blue container. Learn how to adjust for high altitude cook times in the Instant Pot here. In a large bowl mix together ingredients for meatballs. Turn Instant Pot to saute, and melt 2 tbsp butter in the Instant Pot. When the butter is melted form the meatballs and place in the Instant Pot to sear, turning as needed. This will help the meatball hold their form. Pour the chicken broth into the Instant Pot, and use a plastic, wood, or silicone utensil to scrape the bottom of the Instant Pot. Mix in the aminos and mustard, then gently add the meatballs back into the Instant Pot. Lock the lid into place cook on high pressure using the manual function for 5 minutes. Let pressure naturally release for 10 minutes before doing a quick release of the pressure. 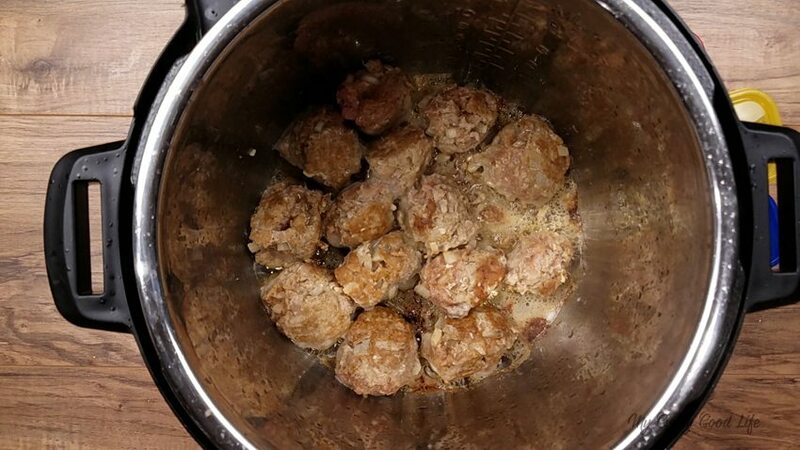 Turn off the Instant Pot, remove the meatballs and let the sauce cool to about room temperature. Whisk in the plain Greek yogurt until the sauce is smooth, and add the parsley. Let sit a couple minutes to allow the parsley time to soften. Pour the sauce over the meatballs and serve topped with parmesan cheese. Note: If the sauce is still hot when the Greek yogurt is mixed it will curdle into cheese curds. So be sure to give the sauce time to cool before mixing in the yogurt. This is the perfect time to prepare side dishes! In a large bowl mix together ingredients for meatballs. In a large saucepan, melt 2 tbsp butter. When the butter is melted form the meatballs and place in the saucepan to sear, turning as needed. This will help the meatballs hold their form. Pour the chicken broth into the saucepan, and use a silicone scraper to scrape the bottom of the pan. Mix in the aminos and mustard, then gently add the meatballs back into the saucepan. Cook for 10 minutes or until the meatballs reach an internal temperature of 165 degrees. Turn off the stovetop heat, remove the meatballs and let the sauce cool to about room temperature. Whisk in the plain Greek yogurt until the sauce is smooth, and add the parsley. Let sit a couple minutes to allow the parsley time to soften. Pour the sauce over the meatballs and serve topped with parmesan cheese. I don’t have an Insta pot. Could I make this on the stove top? It looks amazing! Thanks!! Nevermind – I see it now. Oops! This sounds healthy and yummy! I have a couple questions as I am new on my quest to eat/cook healthier. Is the mustard – dry mustard powder or the condiment? I am not familiar with amino. What is that? I loved this meal – just started the fix a few days ago and this was filling and tasty. And my husband and kids liked it too, so a keeper for sure. Will make a double batch next time to have leftovers. :-) Thanks for all these great recipes – very helpful! How large do you make the meatballs? How many meatballs will be recipe make? Is it possible to do this in the crockpot? If so, what would the directions be? Can I do without the amino? TYIA! Suggestions on how I can replace the yogurt- have to be diary free for my son. Butter is easy to change. Thanks! I used Almond milk Greer yogurt and it was great! I’m sorry about that! If you scroll to the printable box on any recipe, you can see the list of ingredients and recipe directions without interruptions. Does the serving counts include gravy, or is it just for the meatballs? These look so good. What kind of crackers do you use? Can I substitute whole wheat bread crumbs instead?